« Do wind turbines lead to more forest fires? A recent wind turbine fire in Germany exposes the risk of constructing wind farms in drylands and wild lands subject to wildfire. 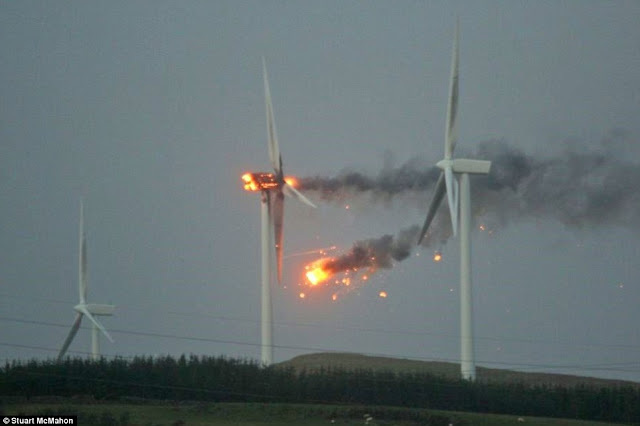 The image below of a turbine explosion and fire in Scotland, illustrates the danger. “You do get fires occasionally and it comes with the territory,” McLachlan said by phone. The turbine may take at least a year to replace, he said. …With many potential causes, “we can’t start any investigation until we have a chance to look at the turbine and in order to do that we have to get to the nacelle,” Andrew Hilton, a spokesman for the company, said of the casing on the tower that houses the turbine’s power-generating components. The company will survey the damage more intensely tomorrow, Hilton said by phone from Aarhus. The site is in the countryside, not in a residential area, he said. 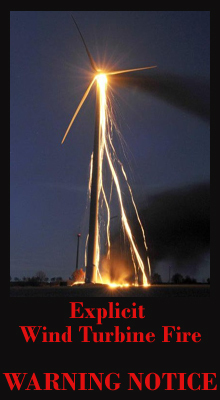 As more people discover the cluster-foque nature of wind farms — from the outlandish costs of service and maintenance, to the inherent unreliability and risk to the power grid, to the human illness caused by proximity to the turbines, etc. etc. etc. — public support for these monstrous monuments to the green dieoff religion should subside. As public opposition to these counter-productive boondoggles grows, a bit of energy reality should eventually be enforced — even in lands such as Germany, where sun and wind faeries are worshiped in all government buildings.